Dads rock! Just ask my daughter who flings open the front door every evening after she hears the beeping of her daddy’s car lock. Even our Chi-weenie (chihuaha-dachsund mix) blazes right after her. There’s a special magic that happens when Dad is around and as Father’s Day approaches, I’m going to be featuring some awesome kindie dads who rock. Kicking off the Father’s Day countdown is Danny Weinkauf, a Grammy award winning musician, producer and composer whose rockstar resume includes being the bassist for They Might Be Giants (“TMBG”). 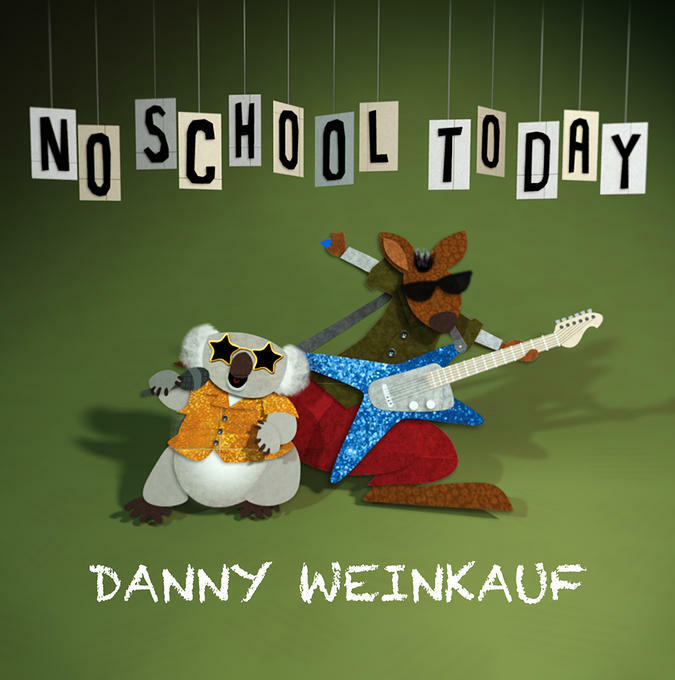 Last April, Weinkauf entered the children’s music genre with a solo debut called No School Today, a collection of well crafted, super catchy power-pop songs, many of which feature his son, Kai. It’s truly a family affair with this album! So in honor of family, Father’s Day and rockstar Dads, today’s feature includes some Q&A with Weinkauf on being a Dad, a touring musician and most importantly his family plans for the upcoming holiday. Check out videos from No School Today by subscribing to Weinkauf’s YouTube channel, get to know the meaning behind the songs on the album at his official site, and buy the music through his online store! The best thing about being the father of 2 is that I have 2 more best friends – I love doing just about anything with my kids. KCG: How will you be celebrating Father’s Day? DW: My son Kai has a best friend who is Indian and their family and mine are getting together so his friend’s dad can show me how to cook a couple of different curries. Then we’re all gonna go to the beach before the sun goes down. I can’t wait – i love Curry!. DW: The best thing about being the father of 2 is that I have 2 more best friends – I love doing just about anything with my kids. What is the hardest thing about being a Dad (especially if you are a touring artist)? DW: Touring, Touring, Touring. When I’m not playing shows for kids and their families I play with They Might Be Giants. We can go away for fairly long stretches of time. It’s tough for my wife and tough for me as I miss my family very much. How often do you play music/sing with your kids? DW: Both of my kids sing or speak on my albums so I often ask them to do a backing track or lead vocals on some tunes. My son is learning how to play guitar , ukulele, and piano, so I try and get him to play with me whenever I can but it’s tricky – he’s a teenager. Do you kids join you during performances? DW: My son Kai has taken the stage to sing “Champion of the Spelling Bee” (which he also sang on my No School Today album) on a couple of occasions if it didn’t conflict with school and sports etc.